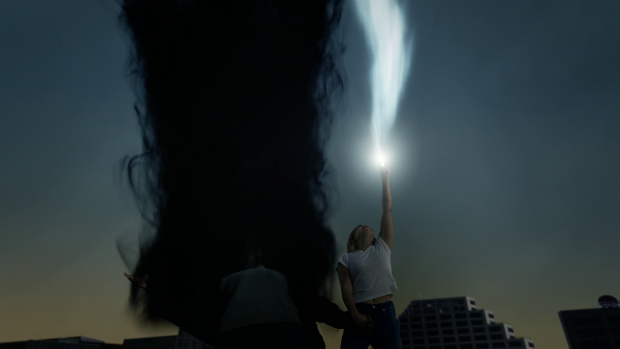 Marvel’s Cloak & Dagger closes out its first season with the fulfilment of a prophecy and some superhero team-up action. The previous episode left Tandy and Tyrone in really intense situations that manage to feed into their individual arcs for the season. Tandy has always been conflicted between wanting to help others and being motivated by self preservation. These are mutually exclusive concepts as far as she’s concerned as helping others puts her in the danger she wishes to avoid. Melissa’s life being threatened acts as the personification of that conflict as Tandy has to choose between helping her mother or protecting herself. Her development over the season has had a few setbacks as her experiences have terrified her to the point that she goes on the defensive once again but it’s clear that deep down she is a good person who cares about other people even if she doesn’t admit that to herself. Last week was about convincing others that she is a bad person out of a desire to validate her own lack of self worth where this episode is all about her embracing the literal and metaphoric light that exists within her. Naturally she chooses to save her mother and embrace her more heroic tendencies. Reluctant heroes are a common trope in many pieces of fiction because people can relate to the fear that encourages inaction. In Tandy’s case her fear has caused her to look out for herself at the expense of others and fail to help people when she could have but she has reached a turning point where she realises she can help and is motivated to do so. The simple “why not?” response when her mother asks her why she has to help people could have easily been a cheesy utterance but Olivia Holt’s line delivery gives it an almost Captain America like sincerity that works so much better than it has any right to. There is still the issue of closure on her father’s death that ties into Roxxon’s evil plan. Tandy is able to use her powers and her well practiced manipulation skills to trick Scarborough into being stuck in his own mind just as Ivan Hess was. Arguably it’s what he deserves and Tandy has found a way to bring him to justice that his money and influence can’t combat. It’s a clever solution and leaves Scarborough on the board to return at a later date. Scarborough is shown to be a fairly shallow villain as far as motivations go. He is entirely motivated by power and profit capped off with a disdain for anyone who doesn’t happen to be him. His justification for all the terrible things he has done is that he has to keep up with competitors like the Rands and the Starks. Scarborough is unquestionably a terrible person so far beyond redemption that he arguably very much deserves what Tandy does to him. Tyrone has to deal with the police being after him as well as the realisation that his efforts to bring down Connors haven’t played out the way he expected them to. 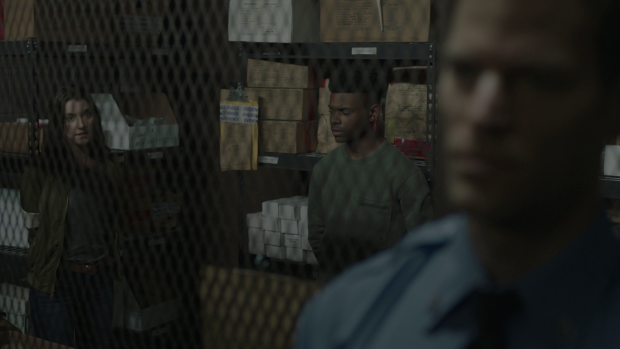 Instead of bringing a corrupt cop and a murderer to justice he finds himself framed for murder which ties into the racial subtext that has helped define this show as it proves what everyone has been saying about the ease of condemning black people. This makes for a powerful realisation for Tyrone and a very tangible issue that he has to deal with. The speech he gives when captured by the corrupt cops where he forces the one guarding him and O’Reilly to really think about what he is doing and how that conflicts with everything he is supposed to stand for. Mentioning how he has a duty to protect him as well as everyone else who pays taxes resonates clearly and forces him to reconsider to the point that he can no longer guard them. It doesn’t really go anywhere as Connors shows up pretty much immediately after but it’s a powerful speech that reinforces his desire to make the world a better place rather than blindly accept it as it is. It’s very much a “change the world one soul at a time” situation but it’s arguably a positive start. This is almost immediately followed by crazed citizens attacking and destroying his cloak in the process which all but breaks Tyrone. It makes for an interesting role reversal in the dynamic between Tandy and Tyrone as she is the optimistic one eager to help where he is on the brink of giving up. The destruction of his cloak is significant to him as it’s the last physical link he had to his brother and he relies on it as a security blanket to control his abilities. The loss of this makes him doubt his ability to do any real good but Tandy is on hand with a much needed pep talk and reminds him of everything he represents to her in order to motivate him to shake himself out of his self defeating attitude and help her solve the problem. This is an important step forward for Tandy as she is shown giving of herself in the form of emotional support rather than stealing as is her normal go to. It works partially though Tyrone is still convinced that he needs the cloak to help control his powers which leads Tandy to hand him his brother’s old hoody. It’s a great moment as we have repeatedly seen Tandy using it to comfort herself in moments of weakness so passing it onto Tyrone symbolically shows that she no longer needs it and recognises that it can benefit someone else. She is also convinced that Tyrone doesn’t need it but recognises that he needs to learn that for himself. Even if he doesn’t need it then gaining a tangible artefact of his brother’s existence is something that is very important to him and could serve as a confidence boost in its own right. Ultimately Tyrone takes that important step forward when he is able to face up to Connors and stop him. What exactly happened to him is left unanswered for now though he has likely been sent to the “Darkforce Dimension” which opens the door to explore that idea in the next season. Connors’ fate isn’t as interesting as what leads up to it as Tyrone defeats him in every possible sense by making it clear to him that he has no power over him or his family any more and that as far as he’s concerned what he did to them isn’t something that will haunt them any more. Connors has no power over him any more and that’s the most important part as it means that he can now move on without having anything hanging over him. The existence of the “Terrors” and the threat they represent being akin to a Zombie Apocalypse is fairly unimaginative though fortunately the episode treats their presence as incidental to the main threat with the focus on how the characters react to what Roxxon has put in motion. This ties into the Voodoo Prophecy of the Divine Pairing tasked with protecting New Orleans from the latest cataclysm. The episode periodically cuts to Chantelle telling Evita about the other times in history that a divine pairing saved New Orleans from disaster and allowed it to prosper until another pairing was required. According to her Tandy and Tyrone are the latest in a long line of those tasked with protecting the people though the drawback is that the restorative action always claims the lives of one of them in a decisive moment. I don’t have a problem with the mythology aspect of this because psychic awareness and a latent form of precognition is entirely possible in the Marvel Cinematic Universe but the issue here is that the show hasn’t really done enough with this idea to make it into more than vague prophetic words teasing a tragedy that ultimately never comes to pass. Tandy and Tyrone are unique when compared to the other divine pairings as prior versions of this were unaware that this was their purpose where Tandy and Tyrone are told by Evita that they are the chosen ones who have to take action. This could be what allows them both to survive rather than them dying as predicted though there is no position on that either way. The identifying mark passes between them and Tandy refuses to accept that Tyrone will die and their combined powers prove to be enough to expel the energy therefore returning the infected people to normal. 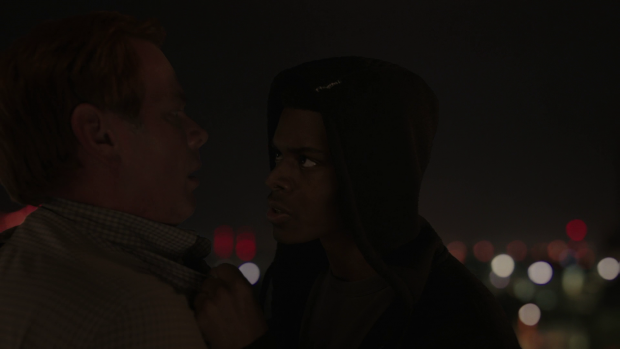 The moment they decide to work together is fairly cheesy with the music and dialogue but it feels like an earned triumph and brings their shared arc around accepting their connection to something of a close allowing them to progress in the following season. The acceptance of this and completion of their shared arc is shown in the final scenes with Tandy returning home to her mother after realising that she does actually need people and that others need her. She has made the decision to stop running and accept that she has connections that should be nurtured. Tyrone is the opposite in that he can’t return to his family because he’s still wanted by the police to takes Tandy’s place at the church. He has still realised the importance of trusting others and knows that he has Tandy looking out for him after all they’ve been through but has to find a way to clear his name before returning to his life. It’s a bittersweet ending for Tyrone but not without hope. O’Reilly finds herself on the wrong end of Connors and is left for dead when she falls into the river after being shot. She is shown emerging from the river changed in some way suggesting that she is on her way to gaining the abilities that she has in the comics and becoming Mayhem. The episode could have done a lot more with her especially after the loss of Officer Fuchs but having her around for next season still leaves plenty of scope for that to be further developed. A strong finale that retains the focus on the characters and concentrates on developing their individual as well as their shared arcs. For Tandy this means embracing her more heroic side and having her actively decide to help people rather than gravitate towards a more selfish outlook as she has done in the past. She starts with her mother and goes from there to save New Orleans. She gets closure on her father’s death by forcing Scarborough into a catatonic state similar to the one she rescued Ivan from and in the process shows that he’s a shallow villain bereft of compassion driven by the pursuit of money and power. Tyrone gives an impassioned speech to a corrupt cop reminding him of everything that he should stand for before taking a step back when his cloak is destroyed and doubts his ability to do good. Tandy’s pep talk helps though he is still convinced he needs a cloak. Despite the setback Tyrone is able to resolve his emotional issues by telling Connors that he can no longer hurt his family because they aren’t afraid of him any more. It’s a great victory for him and leads to an earned cheesy moment where Tandy and Tyrone work together to save New Orleans. This is the culmination of the divine pairing prophecy that is explored throughout this episode with past examples but it doesn’t match up very well with the actions of the characters and doesn’t tie in as well as it should. It’s a good idea just not very well executed. Having the “Terrors” behave like a Zombie Apocalypse is also fairly unimaginative though is treated as incidental to the main character driven story. Resolving the season with Tyrone hiding from the law in Tandy’s church while having Tandy for support and Tandy moving back home after realising that she needs others as much as they need her feels satisfying because it puts the characters in an interesting place for next season while showing that they have grown as people. O’Reilly could have had more to do in this episode but showing her to be on her way to becoming her comic book counterpart is a solid ending for her. A second season of this show has been green lit which is great news as I have greatly enjoyed watching this show. The binary main characters connected by their powers and shared events works really well and the approach taken to developing that is constantly compelling. The first season is more or less self contained though there is plenty of scope to expand on what has been built so far. As long as the focus remains on Tandy and Tyrone with their unique connection then season 2 will be off to a good start. There is so much more that can be done with them as characters as they are still figuring out their place in the world so the next season could showcase them trying to be heroes and finding that complications come with that or maybe one or both of them will spiral out of control in some way that differs from what we’ve seen so far. The divine pairing prophecy can also come up again as I don’t feel this was resolved in a satisfying way. Chantelle will certainly have an opinion on why one of them didn’t die so I suspect that it will be a thread that is picked up in some way. Roxxon is still hanging over the show and I suspect that Scarborough will be replaced with someone equally terrible assuming he doesn’t find his way out of his catatonic state. Either way they represent a powerful and significant threat that can infect any aspect of the show. There is a lot of potential to continue exploring police corruption especially with O’Reilly now apparently having powers of her own. It’s good to see that the second season can start with something of a blank slate though still has recurring elements that can tie into the newer problems and I very much look forward to seeing how that progresses.